If you are not aware of the incredible acts of kindness this group does, please just google Detroit Dog Rescue and check them out. They go places most people would never imagine going so they can rescue neglected animals and give them a new chance on a great life. Please come to our event this Saturday, October 28, 2017 from noon to 3pm and take home a new family member. If you cannot adopt then please consider a donation of food, supplies or money, anything would go a long way. 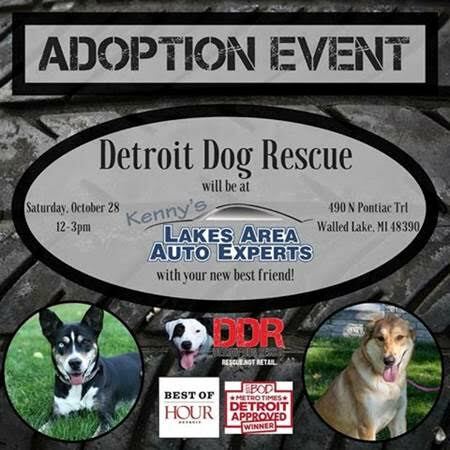 You can drop off donations anytime at Kenny’s Lakes Area Auto Experts as we are a drop-off point for DDR. I hope to see a lot of people this Saturday.